I have been lusting over these guitars for quite a while and have decided to bite the bullet and have one built for me. I think they are really cool looking guitars. Mine will have only the bridge pickup...Chet had Gretsch build a 6120 for him that only had the bridge pickup so he wouldnt have to worry about hitting the neck pickup with his thumb pick...makes sense to me...you can see his Gretsch on the cover of his "At Home" album. I am sure it will take some time to build it, but thats ok..I am excited about it. Who's doing the build? My brother was asking me about Bigsby's recently. Thanks Jerry...you have always been very supportive of my posts and I appreciate that. Actually, we made a couple of changes and mine will have 2 dog ear PAF pus and a Bigsby tail piece, but cosmetically the rest will be the same. Patrick at this point I would rather not say who is doing the build...I will check with him and find out if he is okay with me doing so....thanks for your reponses. It will look like this with those changes...which I think is even better. I have no interest in this guitar, as cool as it is, or the builder's name. Just a coincidence that I was recently asked for Todd Clinesmith's info about building Spanish style guitars.... and this popped up. 2 pick ups and a vibrato tailpiece = too cool. How much will you be selling it for Larry? And another important question, what will it weigh!? you know you arent supposed to ask a girl that question ! I am going to call her Merle...Chet Atkins named his daughter Merle in honor of Merle Travis. So what the heck, Merle it is ! Sounds like a good name to me ! I didn't know it was a she. A Bigsby with a Bigsby. Cool! I love me some wang bar too! Yep Chet Atkins named his only daughter Merle, spelled just like the way Merle Travis spelled it. 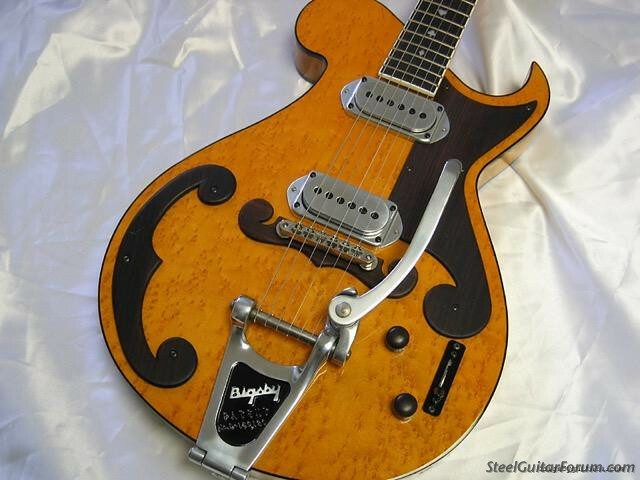 Yes, Jerry, I decided I "had" to have a Bigsby tailpiece on it ! Very appropriate name Larry. I read in GP mag [Oct. 2001] that the concept for the guitar was Merle's. 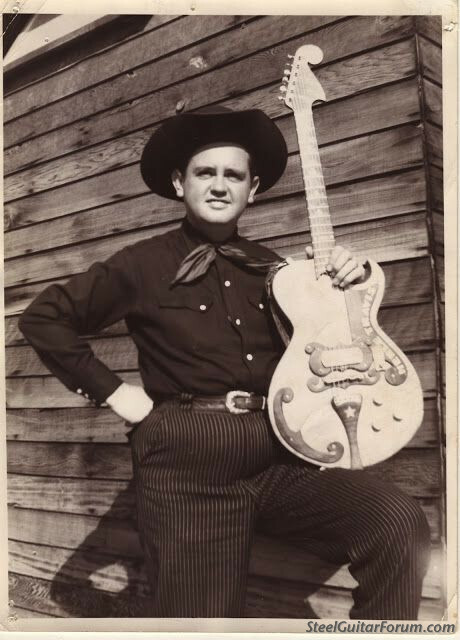 He is quoted as saying he wanted a standard neck guitar with a solid body that would sustain like a lap or pedal steel. He drew up what he wanted, took it Paul Bigsby and asked if he could build it for him. He said he could and so that's it he's holding in the above photo same as the inside back cover of GP mag. Naming it Merle pays tribute to him in light of it being his concept. Thanks Jerry....yes I have the Paul Bigsby story book..a very interesting read with lots of cool pictures of steels and guitars. Are you going to the Dallas show ? I may have it by then and plan to take it to the show for my friend Dave Beaty to see and play. I had the thrill to go to Paul Bigsby's house and shop on Phlox Street, Downey Ca. in 1956. Very interesting man for sure. The guitar is completed and will be shipped to me this week. Here is a demo video of it...I am anxious to play it myself ! Not everyone's cup of tea, but I am excited about it. David Gregory (EmanGuitars.com) was great to work with, sent me updates at all the stages, asked the right questions, and puts lots of time and effort and craftsmanship into it. Thanks for looking. I thought it would sound plank-ey like in an Ernest Tubb song. More like a Fender sound.